For the second of our selection of the essential reads on Pandaw country, our guest contributor is self-confessed "Pandaw junkie" Charlotte Pinder, Who celebrates George Orwell's devastating critique of British Burma in the last years of the Raj. The RV Kindat Pandaw glides effortlessly into the jetty at the little town of Katha in Upper Burma. No great monuments, no notable pagodas to visit here; we have stopped for a different reason, for Katha - or Kyauktada to give it its fictional name - is immortalised as the setting for George Orwell's 1934 debut novel Burmese Days. Young Eric Blair (Orwell was a pen-name) clearly regretted his choice of Burma for his Indian Police Service career by the time he was dispatched to Katha in 1926. After a string of unprestigious postings he found himself in another remote town among a handful of dull Europeans. His disenchantment with the imperial ideal meant that this was to be his last posting; the novel he set here reveals his utter contempt for the British Raj. Burmese Days tells a simple story of doomed love. John Flory is a rapidly ageing bachelor who has squandered his adulthood in Burma (in so many respects similar to Orwell's own background). A book-loving intellectual yearning for refined conversation, for a sitting room with a black piano and "furniture from Rangoon", Flory believes an unattached, pretty girl recently arrived from Paris will offer him the redemption he craves. In the background, the local Europeans wrestle with an exhortation from above to admit a 'native' to their sacred Club ("I'll die in a ditch before I'll see a ni**er in here"). A minor Burmese official schemes and plots his way to greatness by exploiting the gullibility of the naive British Empire-builders. Here the Burmese are portrayed in a damning light – in cheating their employers or as blackmailers, rapists and murderers. Far more surprising for its time is the novel's viciously unsympathetic portrayal of the British residents as bigoted, racist, cruel and grasping snobs scrabbling to uphold the "Pukka Sahibs' code". They eat British (tinned, imported) foods, play endless bridge, repeat inane conversation about dogs, pore over out-of-date British newspapers. Memsahibs never learn a word of Burmese and torment their servants. Hypocritical in moral matters, they start drinking before breakfast - Flory bemoans "booze as the cement of Empire". Men are lazy, leer over scantily dressed magazine models and cavort with native prostitutes. Even the more sympathetic Flory has purchased a concubine for himself, an incident that leads to the novel's far from happy ending. Secure in the conviction of their superiority, what ultimately taints Orwell's colonialists is an unwavering contempt of local peoples. Timber manager Ellis' rantings against a "greasy little sod", "filthy black lips", "black snout", "oily little babu" go unchallenged. Cruelty is rife – even the genial Deputy Commissioner Macgregor reminisces about sending insolent servants to be flogged at the jail. Only Flory seethes at "the lie that we're here to uplift our poor black brothers instead of to rob them". This drama is set in a time of growing nationalism and rebellion throughout the Indian Empire. "The British Raj is finished if you ask me"…. "The best thing we can do is shut up shop and let 'em stew in their own juice". The overt anti-imperialism of the novel and unflattering depictions of the Anglo-Indians led British publishers initially to reject publication of Orwell's novel for fear of libel claims. Names and locations were disguised in the 1935 first UK edition. Yet a renowned contemporary reviewer praised Burmese Days as: "admirable… a crisp, fierce…. attack on the Anglo-Indian". In Burma, conversely, among Orwell's former colleagues, the response was livid. Orwell's superior Stewart at the Police Training School in Mandalay threatened to have him "horsewhipped". Another colleague whined that Orwell had "rather let the side down…." Yet Burmese Days is no mere anti-colonial polemic. A case could even be made for it as the finest novel that the author of Animal Farm and 1984 ever wrote, a deftly-plotted, fast-paced and riveting story. Today it is hard to read it without abhorrence of the blatant racism of the sahibs. (We Pandaw travellers have, after all, journeyed here to marvel at the wonders of Burma). And yet, here is the paradox: it is clear that the book's antihero, Flory, and its author both adore the country. We can revel in Orwell's beautiful, lyrical descriptions of the jungle flora and fauna, in Flory's repeated attempts to share with new arrival, Elizabeth, all that he considers fascinating in Burma: sinuous pwe-dances, delicate teas, exotic aromas and dazzling market produce - exactly what excites us as visitors today. That afternoon, onshore in Katha almost a century later, we meander in pony carts through the sleepy town, halting at colonial-era structures which are startlingly familiar: the tennis court, the Club (a surprisingly unprepossessing building, given its status in the novel as "the real seat of British Power"), the railway station, the Deputy Commissioner's crumbling home, even Orwell's own spartan wooden shack. Once-manicured gardens are now choked with creepers, the Club no longer boasts "swaths of English flowers, phlox and larkspur, hollyhock and petunias … in vast size and richness" and yet the novel has sprung to life before our eyes. Shocking that this could ever disappear, it suddenly seems vital to preserve these dusty colonial relics as witnesses to a story of such profound cultural significance to the history of British Burma. Burmese Days, Penguin Modern Classics paperback £3.99-£9.99, Kindle edition £4.99. 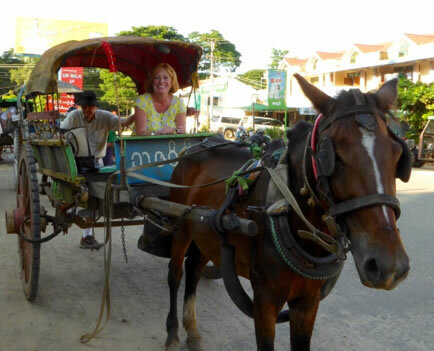 A passionate linguist, educated in Britain, Charlotte has spent much of her adult life working overseas in marketing roles, primarily in the Far East. Her passion for "all-things Asian" was sparked during a youthful first posting to Tokyo (at a time when there were few expats living in Japan and learning the language was a necessity). She has since lived in China and travelled extensively in most countries of the region but has a particular affection for the cultures (and cuisines) of South East Asia. Her first trip to Burma was thirty years ago. A self-confessed Pandaw "junkie", she has joined us on the Mekong in Cambodia, the Red River in Vietnam and the Chindwin/Irrawaddy in Myanmar (describing the experience on the RV Kindat Pandaw as "a food-lover's paradise"). A future adventure on the RV Champa Pandaw from Laos to China is already booked!